With the introduction of the "OS-business" (without conductor) no conductors were more deployed on the trolleybuses and its trailers. In Eberswalde it gave by the way only woman conductors. These became not however, how in our current time usually, unemployed, but they were trained to woman trolleybus drivers and deployed. There the passengers also in spite of the introduction of the "OS-business" had to pay, their allowedly manner slight bonuses in form of the fare respectively a single ticket of the collecting tickets, pay boxes were built into the trolleybuses and trolleybus trailers. These pay boxes were perfectly mechanical equipments, that were developed probably in the rationalization means building of the traffic system. The fare respectively a single ticket of the collecting ticket was thrown in through the pay box slit (1). Then the hand gear was pulled and the in the inside present, into segments partitioned, disk moved around a segment forward (2). At the same time a ticket came out close-by the hand gear of a role from a slit, which was then torn off (3). The function of the pay box represented a "cash of the confidence", an appeal to the honesty of the passengers. Everyone should control everyone and first of all itself. There were still occasional ticket controls. 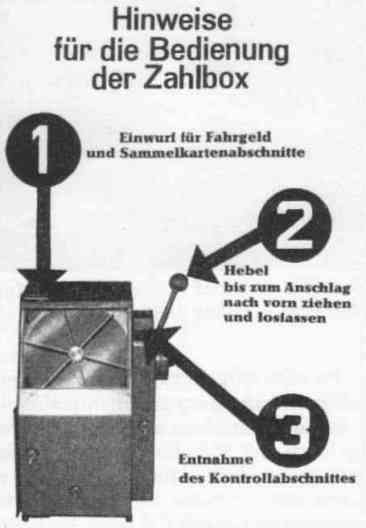 The control feature by the conductors were limited however only to 2 or 3 disk segments of the pay box. With the function of the pay boxes were opened the floodgates to the fare dodger. The Eberswalde children, who used usually the trailers, very often "paid" with buttons, flat washers, screws and nuts. Main thing, it rattled in the pay box! Sometimes they paid also not and unspooled from high spirits the complete ticket role of the pay box. But also many an adult took it with the paying unfortunately not so exactly!